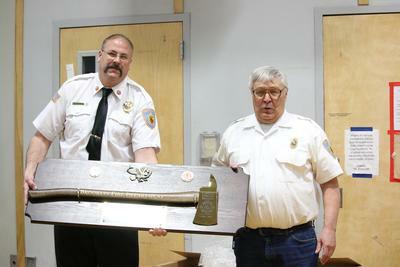 Fire Chief Sam Friend, left, honors Ed Holden for 50 years on the fire department. After three years of research, public hearings and discussion, voters in Brooklin unanimously approved the next steps for the future of internet broadband at Town Meeting April 6. The approved plan was to enter into a shared cost contract agreement with Consolidated Communications for improvements and installation of infrastructure that will improve internet service to 100 percent of the people in Brooklin. Voters approved $105,000 for the venture. That amount will be taken from the surplus account, and matched by Consolidated Communications. A public hearing was held the Monday before Town Meeting, where the selectmen and representatives from Consolidated answered the questions people had leading up to the final vote. The discussion at Town Meeting was brief, and focused mainly on whether or not Consolidated’s infrastructure work would really provide what they said it would once it is finished. Rob Koester of Consolidated Communications answered questions regarding the project, and said that while there were some areas that would only receive the minimum of 10 MGs per minute, most of the town would see much higher speeds. In total, voters approved all warrant items and a municipal budget of $734,800 (without county tax), as well as a school budget of $1,944,078 in just under three hours. During elections the day before, David Reiley received 75 votes to fill a three-year seat on the board of selectmen, while Heather Candage received 84 votes to keep her position as tax collector. Neil Allen received 79 votes to retain his seat as the longtime road commissioner in Brooklin, while Nicholas Carter was voted into a three-year term on the school board with 75 votes. Another open seat on the school board will be filled by a write-in candidate. A handful of people received write-in votes, and will be contacted regarding their interest in serving on the board. During an intermission between voting on school and municipal warrant items, two people in attendance at Town Meeting were recognized for their service to the town. Brooklin Fire Chief Sam Friend spoke about Ed Holden, a member of the fire department for the last 50 years, and presented him with a plaque. Also recognized was Brooklin Selectman Laura Sherman, who did not seek reelection after her three-year term was up this year. Fellow Selectman Deborah Brewster talked about her time serving with Sherman, saying that she hopes Sherman’s service on the board will inspire more “younger folks” to get involved in town politics. This story was edited on 4/11/19 to correct the spelling of Rob Koester’s name. The article was also changed on 4/16/19 to identify Ed Holden as being recognized for his 50 years of service and dedication to the Brooklin Fire Department. 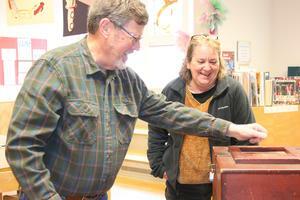 Richard Hero casts his vote in one of two written ballot votes while Treasurer Tammy Andrews looks on at Brooklin Town Meeting on April 6. 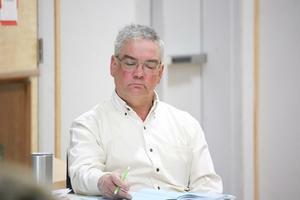 Newly elected selectman David Reiley takes notes during Brooklin Town Meeting on April 6.